Since Google’s acquisition of 111 Eighth Ave., all available space in the building has been taken off the market. The most recent data center transaction in the building was Digital Realty Trust’s sublease of 53,000 square-feet to Telx shortly before the building’s sale. Sabey and local developer Young Woo are under contract to purchase 375 Pearl St., a 1-million-square-foot former Verizon switching building, for an estimated $100 per square-foot from M&T Bank. The building is well-suited for data center use, with very heavy floor loads, high ceiling heights, limited windows, and abundant shaft space. Verizon will maintain a three-floor condo interest in the building. 60 Hudson St., a major carrier hotel, has a 240,000-square-foot block of space available for lease that has attracted attention from both data center and office users. XO Communications has leased the entire eighth floor at 32 Avenue of the Americas. The 49,000-square-foot deal marks the first major data center deal in the building since Coresite leased the seventh floor. Meanwhile, Verizon is marketing the entire 10th floor of the building for sublease, bringing approximately 45,000 square feet with 2 MW of power to market. Telehouse leased Lehman Brothers’ 60,000-square-foot former data center at 85 Tenth Ave., for 15 years. The lease includes all of the equipment and infrastructure left in place by Lehman Brothers and former tenant Level 3 Communications. SoHo CoLo has begun marketing a new data center project at 121 Varick St., a 155,000-square-foot facility with six floors of 13,250 square feet each, available for data center use. SoHo CoLo will be installing the first 10 MW of a 15 MW power commitment this spring. 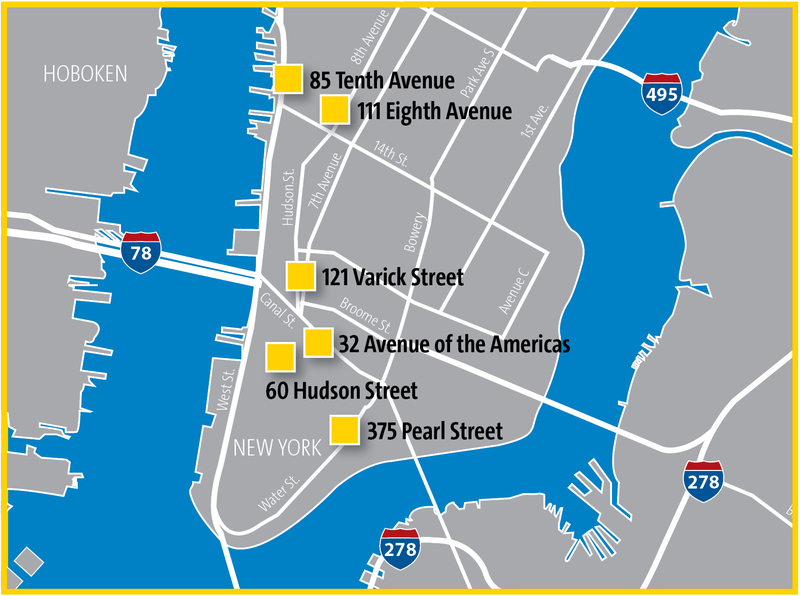 The building’s location along the Hudson Street/Ninth Avenue corridor allows for low latency connection to NYC’s major carrier hotels and networks. i/o Data Centers has leased the 830,000-square-foot former New York Times printing facility in Edison, with plans to rollout the first wholesale data center property dedicated to its own modular data center container solution. The property is next to a major PSE&G switching station and a wealth of fiber located along the NJ Turnpike. Digital Realty Trust leased half of its available powered shell space at 365 South Randolphville Road in Piscataway to Savvis, leaving 56,000 square feet of powered shell space and 11,000 square feet of turnkey data center space available for lease. Sentinel Data Centers has delivered and commissioned its first 10,000-square-foot data center pod to Pfizer. The company has also announced the closing of a $90 million loan led by M&T bank to complete its New Jersey facility and a commitment from Kelso & Company to fund up to $300 million of equity capital for further expansion. DuPont Fabros has delivered Phase 1 of its NJ facility. The first of two phases is 18.2 MW of which approximately 4 MW has been leased to three different tenants. Colocation providers in New Jersey continue to pursue opportunities. Recent announcements include Telx adding an additional 15,000 square feet of raised floor space in Clifton, QTS expanding its Jersey City facility to 50,000 square feet total and Net Access Corporation opening a new 50,000-square-foot facility in Parsippany. Equinix is expected to open its newest location in Secaucus in early 2012. Development projects in New Jersey also continue to move forward. Russo Development has announced a data center development on 71 acres in Somerset. Mountain Development Corporation has filed plans to construct a 213,000-square-foot building next to its existing facility in Clifton (Telx is expected to be the single tenant of the building), Blue Vista Properties is moving forward with plans to redevelop a 270,000-square-foot former industrial building in Edison, and DCI Technology has begun a $4 million renovation of its existing 55,000-square-foot data center facility in Teaneck, which it is marketing for lease. To view New York /New Jersey newsletter in pdf format, click here.